In Surprise TED Talk, Pope Francis Asks The Powerful For 'Revolution Of Tenderness' : The Two-Way The pontiff's message seemed to be directed at the audience in the room. "The more powerful you are," he said, "the more responsible you are to act humbly. If you don't, your power will ruin you." 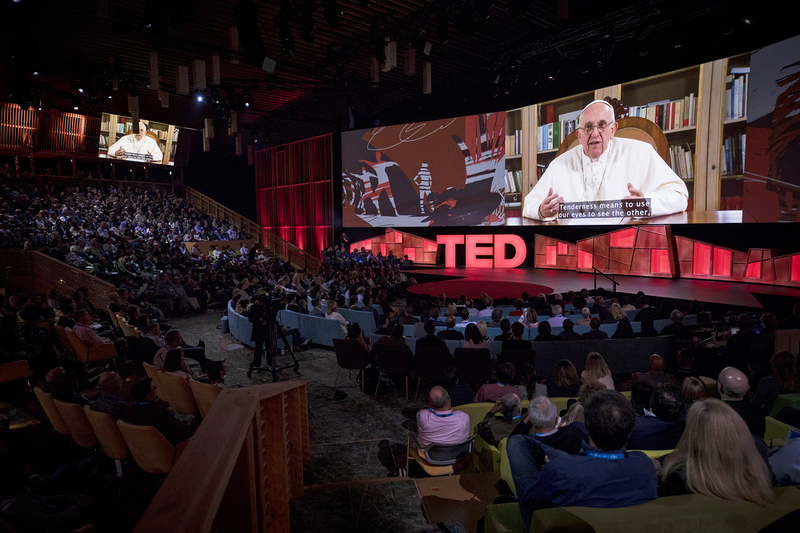 Pope Francis speaks in a video at the TED2017 conference Tuesday in Vancouver, British Columbia. The audience gave him a standing ovation after the talk, which stressed the importance of humility among the powerful. The annual TED conference is known for featuring impressive speakers. Attendees at this year's event in Vancouver have seen Serena Williams and Jorge Ramos, futurists and artificial intelligence experts, health activists and the ACLU's executive director. But on Tuesday evening, one unannounced speaker took the audience by surprise: Pope Francis. The pope was on a big screen rather than onstage, and his address had been recorded and edited earlier in April, but still: even for non-Catholics, the bishop of Rome has a certain gravitas. "Buonasera," he began, speaking in Italian throughout his 17-minute address from his desk at the Vatican. "Or good morning, I am not sure what time it is there." At first, the pope's subject matter seemed familiar: "As I meet, or lend an ear to those who are sick, to the migrants who face terrible hardships in search of a brighter future, to prison inmates who carry a hell of pain inside their hearts, and to those, many of them young, who cannot find a job, I often find myself wondering: 'Why them and not me?' "
But his message quickly moved to the conference's core subject matter (technology and innovation), and seemed to be directed at the audience in the room: the founders of some of the world's biggest tech companies, as well as politicians, artists, entertainers, venture capitalists and leaders of major cultural institutions and foundations. "How wonderful would it be if the growth of scientific and technological innovation would come along with more equality and social inclusion," Francis said. "How wonderful would it be, while we discover faraway planets, to rediscover the needs of the brothers and sisters orbiting around us. How wonderful would it be if solidarity — this beautiful and, at times, inconvenient word — were not simply reduced to social work and became, instead, the default attitude in political, economic and scientific choices, as well as in the relationships among individuals, peoples and countries." The pope spoke during the session in which the 2017 TED Prize winner announced what he'll do with his $1 million prize. The audience watched in silence, says NPR's Nina Gregory, who watched from a simulcast viewing area near the packed theater. "There were people around me who cried, others who watched, rapt, and still others who watched while writing email," she says. "He got a standing ovation in the theater." Nearly 400,000 people around the world have already watched the pope's video and seen him tell the tale of the Good Samaritan, which he called "the story of today's humanity." "People's paths are riddled with suffering, as everything is centered around money and things, instead of people," he said. "And often there is this habit, by people who call themselves 'respectable,' of not taking care of the others, thus leaving behind thousands of human beings, or entire populations, on the side of the road." The pontiff is no stranger to the tools of the digital age; his Twitter account has more than 10 million followers. Nonetheless, getting Francis to address the international conference took many discussions and several trips to Rome, TED's international curator, Bruno Giussani, said in a blog post. Since not many at the Vatican knew of TED, Giussani said, "there was a lot of explaining to do." TED famously coaches its speakers on how to give an effective performance. Giussani said Francis "decided by himself what he wanted to say in the talk," adding that the pope's collaborators "were very receptive to ideas and suggestions" in order to "fine-tune the message." And that message called for a "revolution of tenderness." "Tenderness is not weakness; it is fortitude," Francis said. "It is the path of solidarity, the path of humility. Please, allow me to say it loud and clear: The more powerful you are, the more your actions will have an impact on people, the more responsible you are to act humbly. If you don't, your power will ruin you, and you will ruin the other."